Coming this fall, Evergreen will unveil its latest installation Built by Brooklyn-based artist Virginia Overton, as part of the Don River Valley Park Art Program. Art Program curator Kari Cwynar spoke to Virginia about the exhibition and Virginia's process in developing sculptures for a unique public space like Toronto's Don Valley. 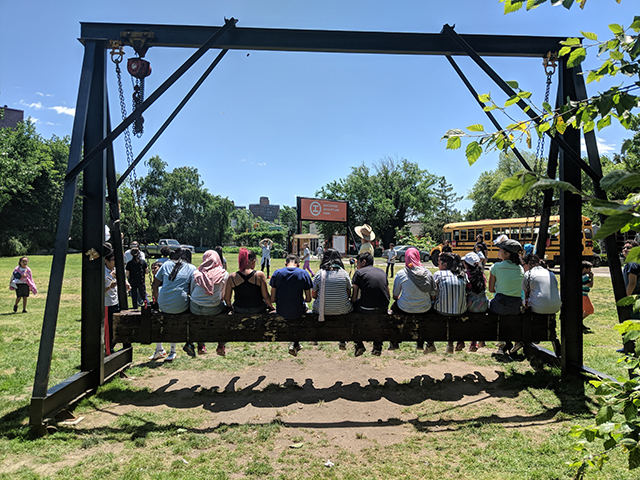 Kari Cwynar: Built was originally developed for Socrates Sculpture Park in New York, where it was installed from May — September 2018, and with whom we’ve partnered to bring part of the installation to the Don River Valley Park. 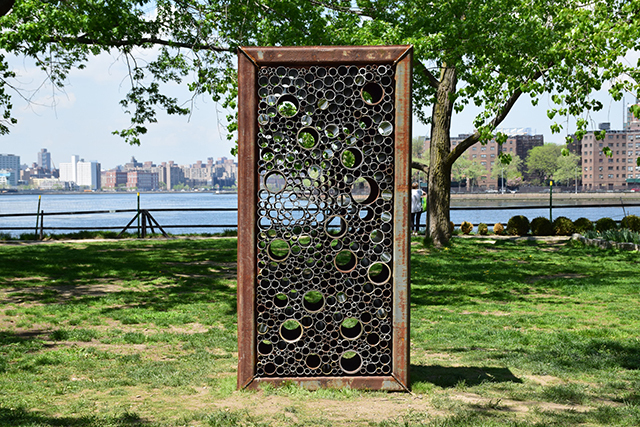 With similarities to the Don River Valley Park, Socrates is a city park that sits along the East River in a post-industrial area of Queens, with an active program of temporary public art projects. Can you describe the process of developing Built for public space, specifically for a park? Virginia Overton: I was familiar with Socrates prior to developing the exhibition. But I still made numerous site visits during various parts of the year preceding my installation. It was important for me to become familiar with how the park is used by its many visitors. The park is open 365 days a year and is used year-round. It’s a neighbourhood park and so there are many people who walk their dogs, go on their morning jogs or come for a picnic. Many of the local schools also bring bus-loads of students to the park to tour the art projects. I also researched the history of the site, its development as a public park and specifically a sculpture park, and the works that have been installed there over the last 35 years. Making work and installing in the outdoors offers a freedom from confined space, but I still need to find locations for sculptures that sit in the landscape in a logical way. Luckily, Socrates had some unique landscaping that allowed me to find fitting spaces for each piece. The Lower Don Trail has some unusual areas as well and this is what led my choice for siting the works. Since the trail is long and rambling, I wanted to find a section that allowed for space between the sculptures but also acted as a unifying space for the grouping of works. KC: Your work is often referred to as site-responsive, or site-specific – do all of your projects begin with this deep dive into the site where you’re working, looking at the architecture, the history of the site, how it’s used? VO: When it is possible, I like to experience the space before deciding what to do there. This requires a slow process and time to let it all soak in. KC: Much of your sculptural work involves using found materials sourced around the site of the exhibition, and at times the same material or object re-appears in different configurations or new sculptures from one year to the next. How do issues of reuse factor into your practice and specifically in Built? VO: The iteration of Built in the Don River Valley and at Evergreen Brick Works uses pieces from the exhibition at Socrates as a jumping off point. 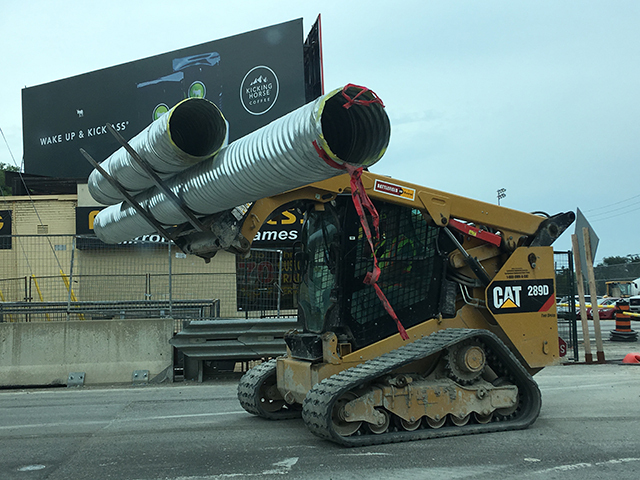 And while I am there installing these existing sculptures, I will be making a couple of new pieces from materials that I have found in Toronto. I also shipped some material from New York that I have used before in previous artworks and will incorporate this with what I’ve found in Toronto. I think this material continuum is essential to the way I work. Either by way of past artworks being springboards for new ones, materials shifting into new works or found materials entering the dialogue at a new site. KC: What kind of materials do you find yourself drawn to? Can you describe some of the particular objects you ended up using in Built and where did you find them? How have these materials come together as sculptures? VO: My choice of materials comes from a reaction to objects as I see them… I rarely have an idea about what something will become, but if, in its found state the object interests me, then I let that interest lead the making of the sculpture. For Socrates, materials came from my studio, several local salvage yards and the storage at the park. Once gathered, these materials sit together and I spend time considering their relationship to each other and to the space. 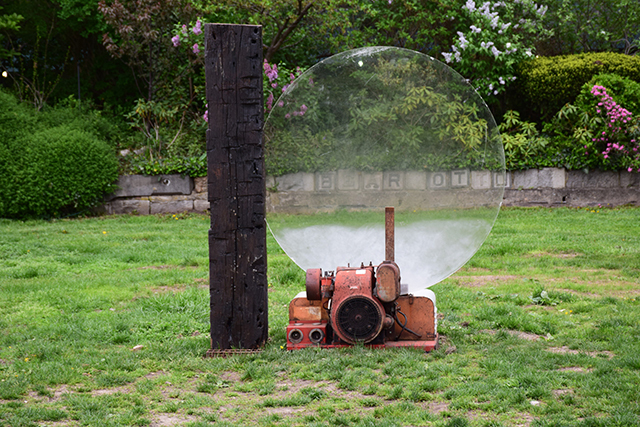 For example, Untitled (Dynamo), which will also be installed in the Don River Valley Park, was made from disparate objects: a beam from a building salvage yard, a thick round piece of acrylic that I had found near my studio and a generator motor that came out of one of the pick-up trucks that eventually became another work for the show, Untitled (Mobile). These relationships allow continuity between the works and extend the material conversation. For Toronto, I’ll start making the new sculptures when I arrive there in mid-October, with the material we’ve gathered and shipped. This might include a metal rack found on the street in west-end Toronto, an old telephone pole from Evergreen Brick Works, brought together with slabs of salvaged marble, which is a recurring material in my practice. But the real work begins when I am there on site, thinking about the materials in relation to the area. KC: Part of the inspiration for Untitled (Suspended Beam) came from looking at images of public artworks in the 1960s and 1970s, where visitors would touch, climb and play on the artworks. This interactivity creates a different relationship to art and allows for a more hands-on understanding of sculpture and material. Is something that you are exploring particularly with works in public space? VO: The pieces that I looked at from the ‘50s, ‘60s and ‘70s were not intentionally interactive. Yet, the archived photographs that I saw showed people sitting and climbing on the sculptures. It made me think about the access that people have to artwork when they are outdoors and the way that they feel comfortable to approach and interact with artwork sited in an environment they are familiar with. Untitled (Suspended Beam) takes this idea and gives an open invitation for passersby to sit and take a rest; to look at the space around them, but also to look at the components brought together to make the work. 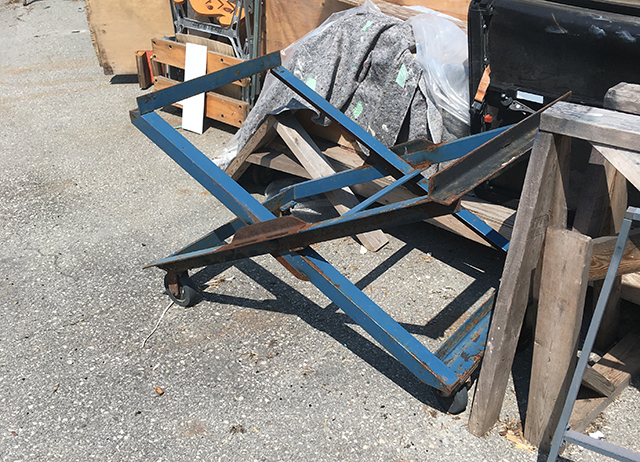 The materials used for Untitled (Suspended Beam) are all industrial objects from disparate locales: the gantry was formerly in use at Socrates Sculpture Park in their work area, and the beam used as a support structure in an old warehouse. The components are familiar to anyone, but here they are given new ways of working. KC: This is your first project in Toronto, and in preparation you visited the Don Valley, the lakeshore and Evergreen in spring and summer. What were your initial impressions of the Don Valley? Which elements of the area do you hope to engage in adapting Built for the valley? 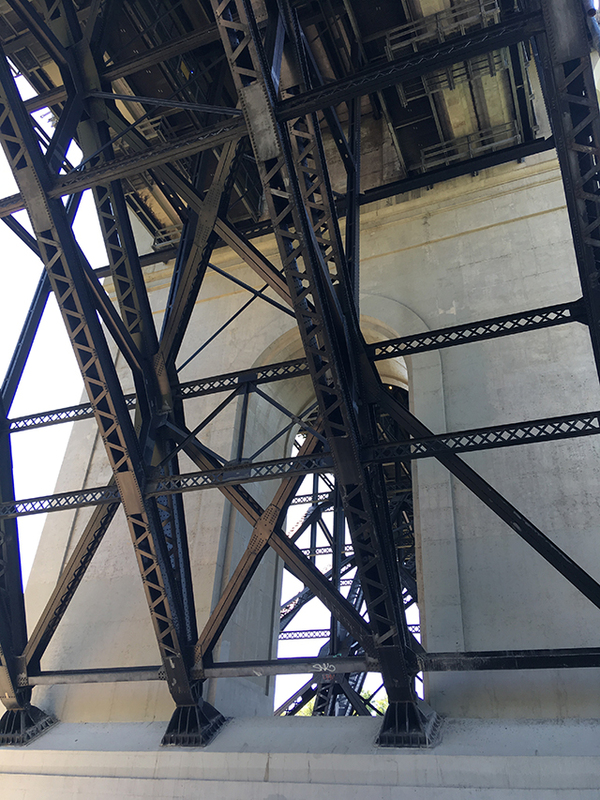 VO: I like the abandoned “cloverleaf” that is part of the Lower Don Trail, where Untitled (Suspended Beam), Untitled (Dynamo) and Untitled (4x8 View) will be installed. It’s one small section of the long pathway, but it creates a discrete area by its shape, bracketed on one end by a bridge overpass and a more forested area on the other. It’s an open curving part of the path that will allow a way of siting several works in conversation with each other and takes into consideration the movement of the landscape.